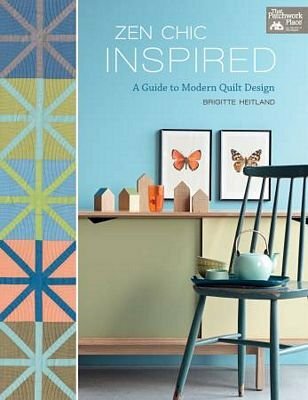 80 pages of amazing inspiration and patterns by quilter and interior design expert, Brigitte Heitland of Zen Chic. Design a modern quilt the Zen Chic way! Quilter and interior design expert, Brigitte Heitland, shows you how to use the unique colors and decor elements in your favorite rooms to inspire quilts that will be right at home. You don't have to be an interior designer to make a modern quilt that's the highlight of your living space -- Brigitte explains it all. Get instant inspiration with patterns ranging from simple patchwork to clever of styled rooms with easy- to-understand color palettes for foolproof fabric selection. 80 pages, Soft cover, by Brigitte Heitland, Published by That Patchwork Place (plus Martingale).